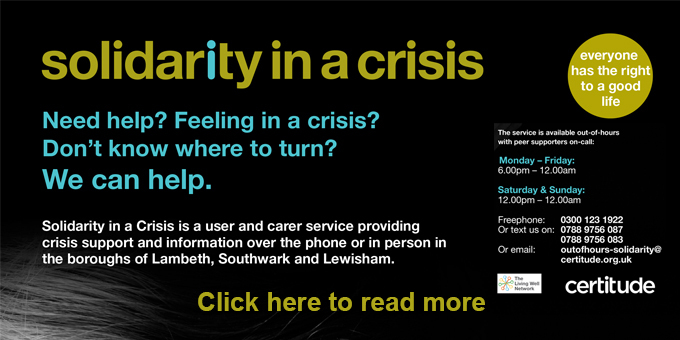 Solidarity in a Crisis peer support service is expanding into Southwark and Lewisham. It has been an exciting time for the Lambeth service, run by Certitude, which has gone from a weekend crisis phone line to seven nights a week. It has also been cited as a model of good practice in the London mental health crisis commissioning: Case studies (Strategic Clinical Networks, NHS England). The case studies are practical examples, which alongside the guide provide standards for the future commissioning of crisis services and is London’s response to the Crisis Concordat. Patrick Nyikavaranda, Peer Involvement Co-ordinator, says it was an “amazing experience” to share with others what works and the challenges faced in “ensuring that people avoid, deal with or build resilience with each crisis they experience”. Meanwhile, the team is growing and there are “learning opportunities and new challenges that arise on a daily basis”. Having new Team Leader Maria Gonzales on board, who is “inspirational, understands how to support people and is committed and passionate to working with people in distress has been a bonus”. He adds that there have been many challenges with the project’s increased profile, the complexities of some of the calls, as well as the transition from a small team to a service expanding to other boroughs. The stark reality is that the service has been a lifesaver for some… “quite amazing when you think we are just listening”, says Patrick almost apologetically about the lived experience peer support tenets of being genuine, empathetic and congruent. Patrick has nothing but praise for the 11-strong team (they have recently recruited two new people) who use their lived experience to listen and support people on the phone or meet in the community for a coffee at the weekend. Each peer supporter has benefited from being part of Solidarity in a Crisis and there are hopes that more people will have that chance as the service expands. Through their lived experience, people “find healing as much as they begin to heal others, find solace as much as they provide comfort, are empowered as much as they facilitate choice and control in the lives of the individuals who access the service”. Anna found a Solidarity in a Crisis flyer in her GP’s surgery in June 2014. She was struggling after she had returned to her job in corporate marketing, she thinks, too soon after her hospital admission. She was hearing voices and her medication wasn’t working. She describes how the first SiaC peer supporter she spoke to on the phone that night helped to “talk me down”, when she was suffering from “extreme anxiety”. That, as well as sharing his own experiences and adding, “some wise words, which were a lifesaver”, have helped her get through the darkest times. A peer supporter who has been with the service since its inception puts it thus: “Being part of Solidarity, now coming up to its third year, has been an incredible journey; in those moments of speaking to individuals has been filled with some sadness knowing the person is experiencing distress, but also a great privilege to be able to ‘be there’ for that person in a way they have needed it during the listening. Certitude’s Director of Mental Health Nicholas Campbell-Watts is excited and inspired by the opportunity to extend Solidarity’s work into Southwark and Lewisham and they will be recruiting local people to be on the phones from their own homes. “Peer support should be part of the integrated offer of support available to people at times of personal crisis,” he says. “We know from the stories of people in Lambeth who have used SiaC that being heard, understood and accepted by someone else with a shared experience can be life-changing. SiaC was available throughout Christmas and New year, including Bank Holidays as this can be a bleak time for people. Read more about the London response to mental health crisis commissioning below.